Source: The Design Forum Inc. 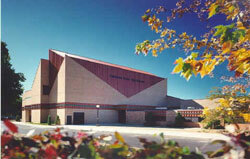 The 140,000 square foot expansion of Caledonia Middle/High School was completed in September 1989 at a cost of $11.5 million. Included in the project was an enlarged media center, improved physical education facilities, a new performing arts center, central food service facilities, and classroom facilities to support a 20 percent increase in enrollment. The intent was to design a facility for the students and community which would encourage interaction and generate a sense of pride. The Design Forum Inc., 124 E. Fulton, Grand Rapids, MI 49503. Tel: 616-454-1398; Fax: 616-454-0944.